I am a junk food addict and I’ve just taken the first step into recovery by admitting it. But I don’t think I’ll ever be able to abstain from eating junk food. I do however, feel guilty about the copious amounts of wrappers that I discard and how it’s not very environmentally friendly. 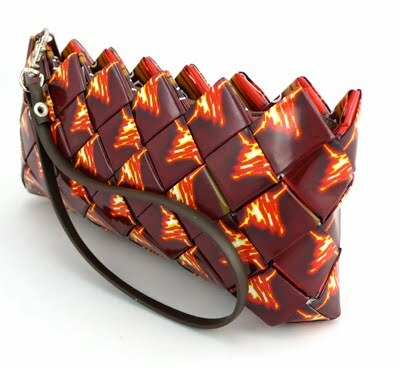 Recently though, I stumbled upon Ecoist, a gem of a website that transforms candy wrappers, chips packets etc into handbags which makes me feel a tad better. Of course, they don’t take discarded waste from people like us, but rather use post-industrial waste as their raw material, (i.e. candy wrappers, chip bags, soda bottle labels, and other waste-bound materials that are misprinted.) Normally, I find these sorts of upcycling of products to be quite tacky but Ecoist manages to upcycle with style. I’m particularly taken by the recycled pull tab coin purse which would be perfect as a clutch or just an all purpose bag to hold my phone, cardholder etc. Their Frito-Lay collection is also pretty darn cool. To my dismay, they don’t have a flaming hot Cheetos design (which I would buy in an instant as I have this giant addiction to them) but their Doritos clutch is also a standout. So much so that I’m contemplating getting this for a fellow junk food addict’s birthday. What do you think? Would I risk having someone eat the bag in a moment of weakness?